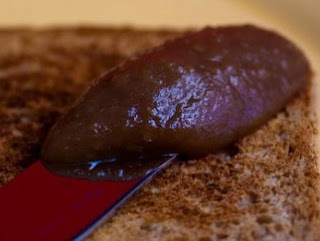 Homemade Apple Butter (sugar free) - San Diego Dining Dish! If you follow my tweets, you will know a bit about my reasoning for trying to make apple butter, but the logic follows my usual "make my own" line of reasoning. I make the said thing...sometimes with results indicating that buying the expensive item is absolutely worth it! None of these reasons really apply to making your own apple butter. The germination of the idea of making my own apple butter came about from my frustration at being unable to find apple butter free of HFCS that wasn't $6 a jar...so I guess it was expense related. However, considering the number of apples necessary to make the 18 oz. jar of apple butter....well...unless you've an apple tree in your back yard, financially it's a wash. The best way to make the apple butter is in the crockpot. Since the apples must cook so long, it's nice to be able to leave or sleep without worry. Peel and core the apples, then slice into quarters. Dump them into the crockpot, and cook on low for 8 hours, leaving the lid ajar, checking periodically and stirring. Add the spices, and cook an additional 6 hours on low until brown and mushy. Smooth out with an immersion mixer, if desired. Place in sealed containers and keep in the fridge. If you want to do full out canning, some amazing sources are here. And that's it! See? Easy, just a little plan aheady (yep, I made up that word). Lots of beneficial reading here, many thanks! I was searching on yahoo when I observed your submit, I’m going to add your feed to Google Reader, I look forward to more from you.